As I mentioned in my most recent Want it Wednesday post, I've been talking to Lizzi from Makeup and Smell the Coffee a lot lately. Well, when I say talking I mean tweeting but, hey, it's the talking of the 21st century. Lizzi is a beauty blogger, make up artist and all round beauty lover with an unnatural love for Illamasqua cosmetics. Whenever I say I'm looking for ANYTHING cosmetics related, Lizzi can tell me the Illamasqua equivalent and recommends it. Being from Perth, Western Australia, I don't have access to an Illamasqua counter and, therefore, have never tried anything. I always want to check out colours before buying eyeshadows etc and, as I'm sure everyone does, I want to be colour matched to a foundation before buying it. I swear, whenever I tell her I've never tried Illamasqua I can feel her twitching all the way from Victoria. Lizzi and I were recently talking about make up brushes and she mentioned that she was wanting to try a selection of brushes from Essence but wasn't able to buy them from the Priceline or Target near her. Given that both my Priceline and Target stock them I decided to pick some up for her and send them. I can't remember the exact names of the brushes I sent but I sent 2 x crease/pencil style brushes and 2 x flat/fluffy shader brushes. If you know the actual names of these brushes, please comment below. I can't find them anywhere on the website.. Anyway, on Tuesday I arrived home to find a package was waiting for me. Who was it from, I hear you asking? Lizzi! Along with a letter written on pink paper (my favourite colour! 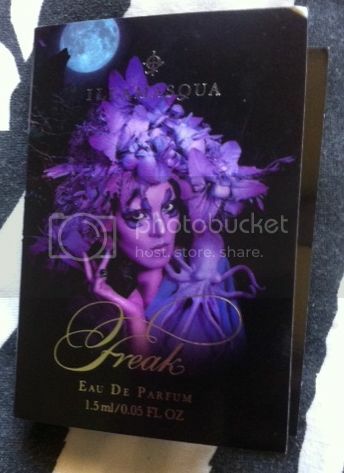 ), she sent me an Illamasqua Liquid Metal in Solstice and a sample of their fragrance, Freak. In her letter she said she wanted me to have something from Illamasqua and thought this beautiful cream eyeshadow would 'jazz up' a neutral eye. Lizzi, you know me too well. Both of these products are incredible, Lizzi, and I certainly know what you mean about the perfume now. Thank you so much for this, Lizzi! I really, really appreciate it, as I'm sure you can tell. 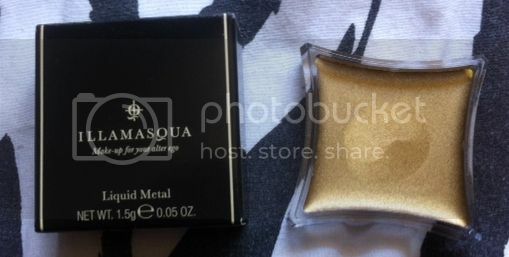 The Liquid Metal is absolutely beautiful and I can't stop looking at the Illamasqua site now. I can't wait to try some other stuff. Here's hoping they bring a counter to Perth sometime soon! Have you ever received an unexpected parcel? What was in it? Want to create an on trend eye look? Click here for my latest giveaway. I can't even tell you the names, I threw out the packs! I'm glad you like the goodies! Oh, and it's not an unnatural love, it's perfectly natural and made in heaven!